Over the last few posts, I’ve talked about why Euoplocephalus tutus is a valid genus and species, how the Horseshoe Canyon Formation ankylosaurid is really Anodontosaurus lambei, and how the headless and clubless holotype of Scolosaurus cutleri is most likely the same species as the ankylosaurid from the Two Medicine Formation. Here’s a diagram summarizing some of the key points from the paper. One ankylosaur I didn’t talk about in the previous posts was Dyoplosaurus acutosquameus, an ankylosaurid long synonymized with Euoplocephalus tutus but resurrected by me and my colleagues Michael Burns andRobin Sissons back in 2009. ROM 784, holotype of Dyoplosaurus acutosquameus, from Arbour et al. (2009). The holotype of Dyoplosaurus, ROM 784, is another really nice specimen, consisting mostly of the back half of the animal (although a fragmentary skull is also preserved). Dyoplosaurus differs from Euoplocephalus in the shape of the hooves on the hind foot (which are more triangular than in other ankylosaurs), and in some aspects of the pelvis. The tail club knob is very narrow compared to almost all other tail clubs from the Dinosaur Park Formation, although it’s not entirely clear how much of this is related to ontogeny versus taxonomy. Do tail clubs start off narrow and become increasingly wider as the animal grows? Or do they maintain approximately the same proportions and just increase in size? The sole tail club knob for Scolosaurus is about the same width as in ROM 784, but the knob is round and about as long as wide. If knob proportions changed as they got bigger, we’d expect knobs of the same width to have about the same length:width ratio, but that isn’t the case between TMP 2001.42.9 and ROM 784. We’ll need more specimens in order to really test this hypothesis, but for now I’m tentatively considering the narrow tail club knob of Dyoplosaurus to be a characteristic of that genus. 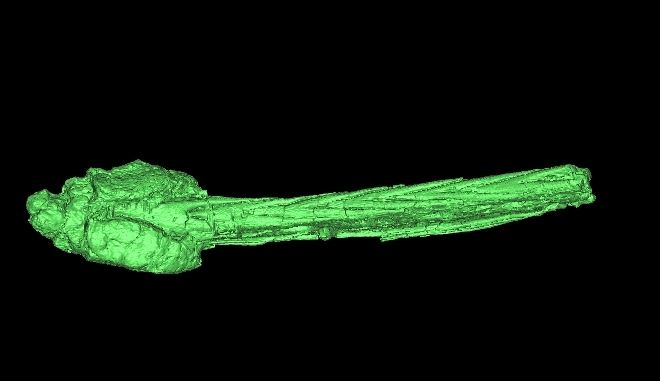 And because of that, there is one other isolated tail club that may be referable to Dyoplosaurus – UALVP 47273, a specimen I CT scanned and used in my biomechanics of tail clubbing project. Digital model of UALVP 47273 from CT scans, made using Mimics. Going from one to four species is a big increase in diversity. Is this a reasonable conclusion based on the patterns of diversity in other dinosaurs? I think so. Euoplocephalus was already kind of weird for dinosaurs from Alberta because it occurred in the Oldman Formation, throughout the Dinosaur Park Formation, and throughout the Horseshoe Canyon Formation. Few dinosaur species are found in all three formations, and even within the Dinosaur Park Formation there are three faunal zones with distinct sets of species. Based on my research, there is now good evidence to suggest that Euoplocephalus tutus was primarily found in Megaherbivore Assemblage Zone 1 (sensu Mallon et al. 2012), which represents about the lower 30 m of the formation. Anodontosaurus lambei is almost exclusively found in the Horseshoe Canyon, with only one specimen, TMP 1997.132.1, found in the upper part of the Dinosaur Park Formation. Scolosaurus is mostly present in the Two Medicine Formation, and the holotype is either from the lowest Dinosaur Park Formation, or perhaps from the Oldman Formation. Finally, Dyoplosaurus is from the lowest Dinosaur Park Formation as well. 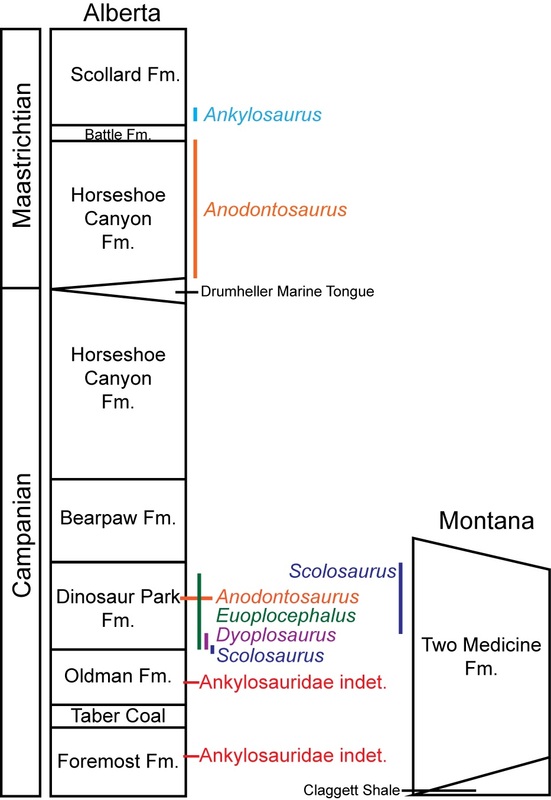 Campanian-Maastrichtian ankylosaurids from Alberta and Montana, from Arbour and Currie (2013). So, where do I go from here? Well, for my PhD dissertation I’m trying to better understand the evolution of ankylosaurid dinosaurs, and so knowing who all of the players are is really essential for constructing a revised phylogenetic tree. 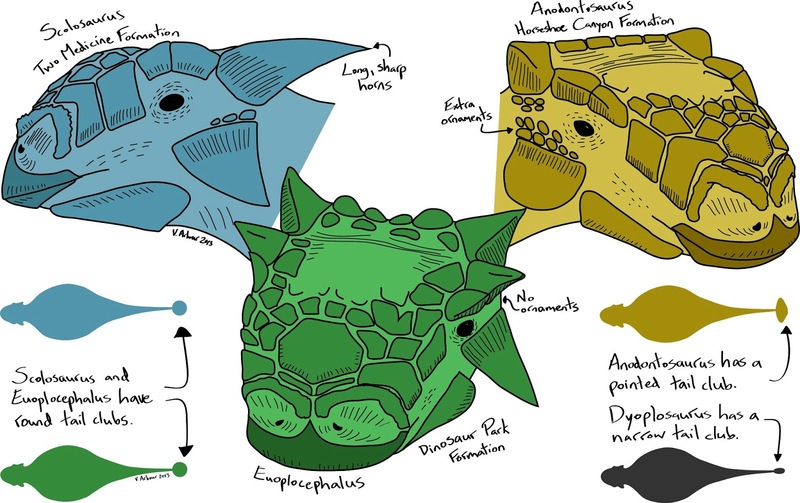 Understanding variation in cranial ornamentation in Euoplocephalus will also help me understand which other ankylosaur species are valid or need to be synonymized, or maybe even identify some new species. I also now know that tail club shapes are at least somewhat taxonomically informative, and this leads to questions about function and behaviour. If there really are three ankylosaurid species in the lower Dinosaur Park Formation, what does that mean for niche partitioning among similar large herbivore species? Why does Scolosaurus appear in the geologically older Oldman Formation, disappear, and then reappear in the younger upper Two Medicine Formation? Does this reflect habitat preferences in ankylosaurid species? As usual in science, answering one question leads to many more. I’ve also had some people asking if there’s anything going on with the Albertan nodosaurid ankylosaurs. My fellow grad student Mike Burns is currently working on the nightmare of taxonomy that is Edmontonia longiceps, Edmontonia rugosidens, Panoplosaurus mirus, and various combinations thereof. I’m looking forward to seeing what he comes up with! And of course, don’t forget that the Royal Tyrrell Museum collected an astonishingly good nodosaurid (probably) fossil from Early Cretaceous marine sediments near Fort McMurray, Alberta, in spring 2011. If you’re visiting the Tyrrell this summer, you can see parts of it being prepared in the lab. Tomorrow I am off to Dinosaur Provincial Park for a brief bit of fieldwork, including, hopefully, a search for the Scolosaurus quarry. 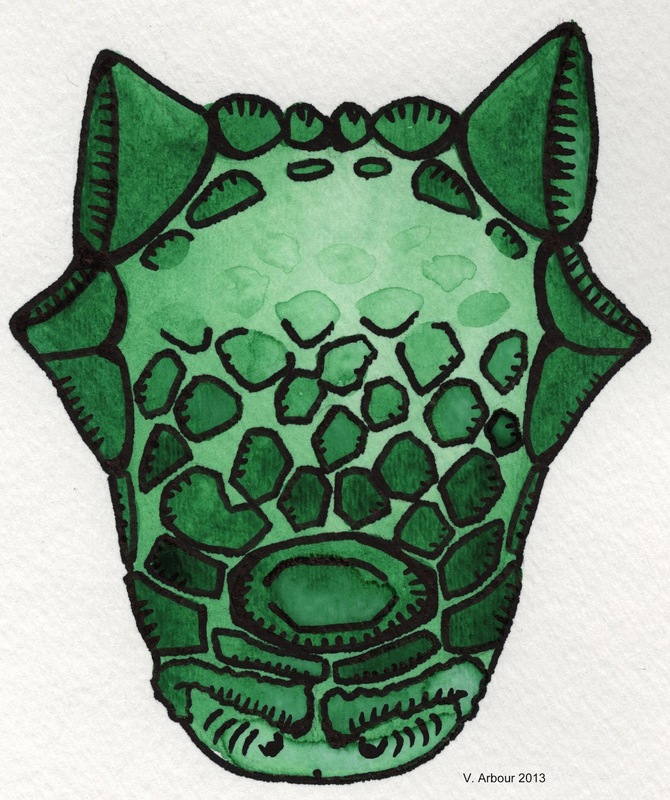 Wish me luck, and hopefully there will be even more ankylosaur news over the next couple of months. Arbour VM. 2009. Estimating impact forces of tail club strikes by ankylosaurid dinosaurs. PLOS ONE 4:e6738. Arbour VM, Snively E. 2009. Finite element analyses of ankylosaurid dinosaur tail club impacts. Anatomical Record 292:1412-1426. Arbour VM, Currie PJ. 2013. Euoplocephalus tutus and the diversity of ankylosaurid dinosaurs in the Late Cretaceous of Alberta, Canada, and Montana, USA. PLOS ONE 8:e62421. Hill SR. 2012. An unconvential discovery from an unconventional resource: recovery of an Early Cretaceous ankylosaur fossil from an oil sands mining operation, Fort McMurray, Alberta, Canada. Search and Discovery Article #70121, adapted from poster and extended abstract presented at AAPG Annual Convention and Exhibition, Long Beach, California, April 22-25, 2012. Mallon JC, Evans DC, Ryan MJ, Anderson JS. 2012. Megaherbivorous dinosaur turnover in the Dinosaur Park Formation (upper Campanian) of Alberta, Canada. Palaeogeography, Palaeoclimatology, Palaeoecology 350-352:124-138. Edmontonia, it should be noted, is also a lot more geographically widespread than the “Euoplocephalus” complex. It's been found in places as far away as Alaska and Texas in addition to Alberta, Montana, and South Dakota. But is the geologically youngest material really Edmontonia? Researchers who excavated a WY specimen suggested it is a new genus. Unfortunately the HMNS went belly up, so there may be a long wait before it's published. Sure, it's unusual for a genus to span three formations and more than one stage. I note, however, Anodontosaurus's temporal range extends over most of the former E. tutus span–several million years and two stages.